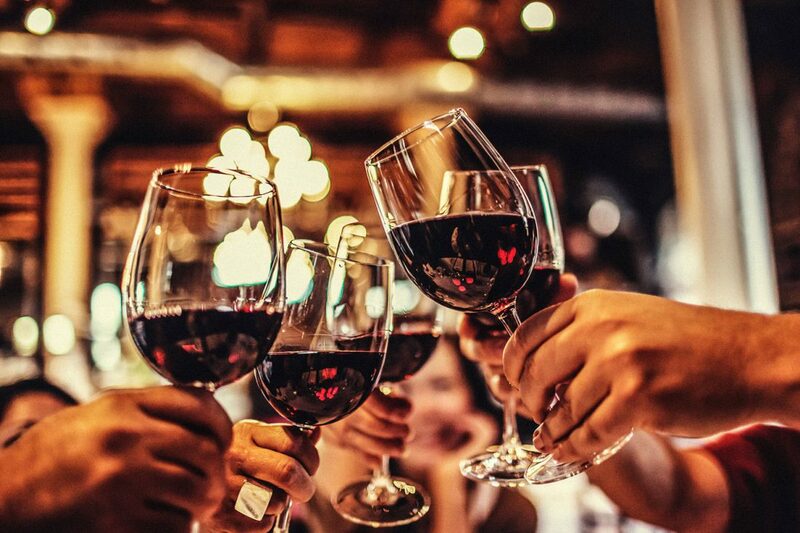 Wine production totaled 250 million hectoliters last year, down 8.6 percent from 2016, data from the Paris-based International Organisation of Vine and Wine (OIV) released on Tuesday showed. It is the lowest level since 1957, when it had fallen to 173.8 million hectoliters, the OIV told Reuters. A hectoliter represents 100 liters, or the equivalent of just over 133 standard 75 cl wine bottles. Rising global temperatures will ultimately lead to an upward shift of the ideal grape-growing zone throughout the world, markedly changing local wine industries either for the worse in the case of those already teetering on being too hot for grapes, or for the better for those that were historically too cold but now are within that 10oC range for quality wine grape growth. Models also predict that brand new areas could be suitable for wine grape growing that had not been considered in the past. If no attempts to mitigate climate change are made, by 2100 the US will likely see an 81% reduction in suitable wine grape acreage (White et al, 2006), with upwards of half of the current acreage in Napa and Santa Barbara counties lost by 2040 (Diffenbaugh et al, 2011). Two concepts central to higher end French wines are the notion of “terroir“, which links the style of the wines to the specific locations where the grapes are grown and the wine is made, and the Appellation d’origine contrôlée (AOC) system, replaced by the Appellation d’Origin Protégée (AOP) system in 2012. Appellation rules closely define which grape varieties and winemaking practices are approved for classification in each of France’s several hundred geographically defined appellations, which can cover entire regions, individual villages or even specific vineyards. Terroir is the basis of the French wine appellation d’origine contrôlée (AOC) system, which is a model for wine appellation and regulation in France and around the world. The AOC system presumes that the land from which the grapes are grown imparts a unique quality that is specific to that growing site (the plants’ habitat). The extent of terroir’s significance is debated in the wine industry. The appellation d’origine contrôlée (AOC; French pronunciation: ​[a.pɛ.la.sjɔ̃ dɔ.ʁi.ʒin kɔ̃.tʁo.le]; “protected designation of origin”) is the French certification granted to certain French geographical indications for wines, cheeses, butters, and other agricultural products, all under the auspices of the government bureau Institut national des appellations d’origine, now called Institut national de l’origine et de la qualité (INAO). It is based on the concept of terroir. There are currently over 300 French wines entitled to the designation AOC on their label. On the other hand, while the process of label approval is enforced to the millimetre, the quality control for the wine in the bottle is much less strict. While a blind taster must approve the wine for it to receive AOC classification, this tasting often occurs before the product is even bottled, and by a local expert who may well have ties to the local vintners. Even if the taster is objective, the wine sample may not be representative of the actual product, and there is almost no way to verify that the finished bottled product is the same as the original AOC sample. 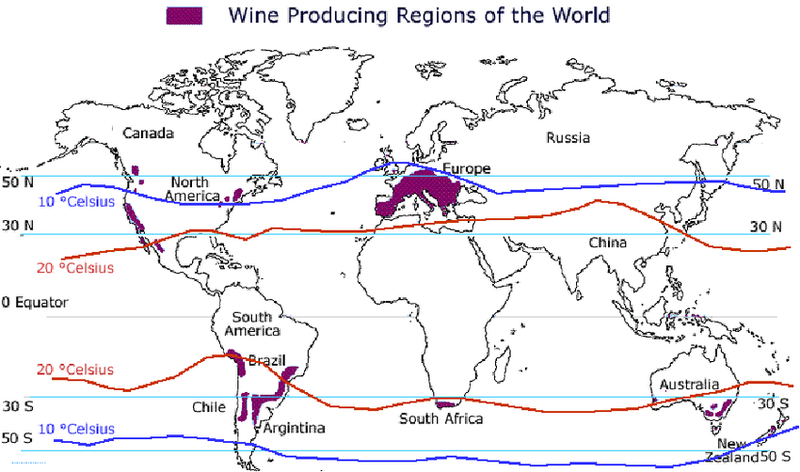 Such sensitivity to location is global; Figure 1 shows the distribution of wine-producing regions. I was confronted with the power of this narrow geographical distribution during my recent visit to New Zealand. I love New Zealand’s white wine, so we went to visit some of the wineries on the South Island, not far from Christchurch. I knew that wine production in New Zealand could be traced to the mid-19th Century when the British were in control. Britain has never been known for its wine production, so I asked the owner how the tradition came about. He smiled and told me to have a look at a map. Many of the residents’ ancestors came from Europe; they knew where Bordeaux was in the northern hemisphere and they figured that since they were in a similar location within the southern hemisphere it was worth a try. Figure 1 is not very high resolution but one can see that he was approximately right. The decision was location-based. Now that climate change is shifting various regions’ climates, the terroir system will have to be adjusted. Next week I will try to look at the impact of climate change on the location sensitivities of other foods and drinks. This entry was posted in Anthropocene, Anthropogenic, Climate Change, Sustainability and tagged AOC, appellation, Bordeaux, British, California, climate, Climate Change, Climate Change Denial, Climate Change Deniers, Climate Skeptics, Environment, French wine, Future, Global Warming, grape, History, location, Napa Valley, New Zealand, output, production, Science, terroir, wine, wine production. Bookmark the permalink.